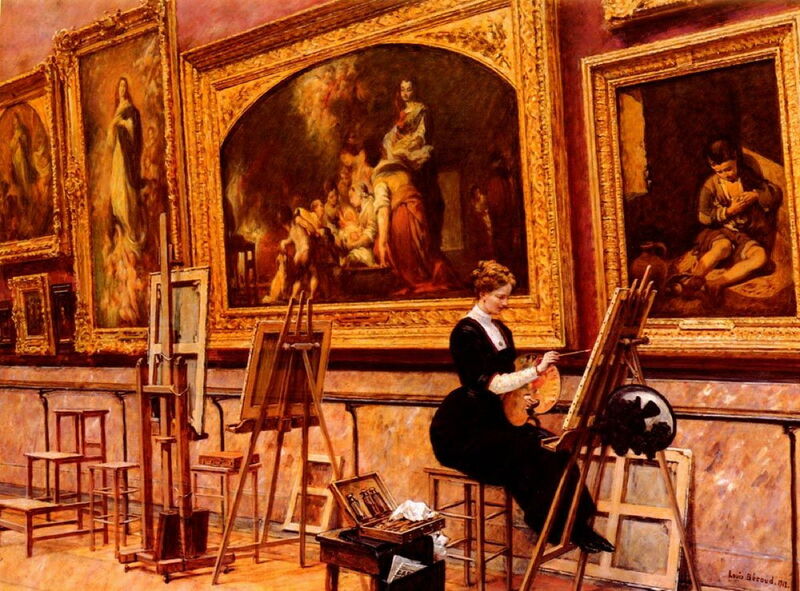 Like many painters, Louis Béroud (1852–1930) painted in the Louvre. On the morning of 22 August 1911, he arrived at the museum to paint its star work, which for so many is the only reason for visiting it: Leonardo da Vinci’s Mona Lisa. Instead of seeing the painting in its place on the wall, there were just the four metal pegs where it had been hanging. As a regular copyist, Béroud knew who to contact, to find out what was happening with the painting. It was assumed that the work had been removed for photography, which was quite a common occurrence at the time. No one was particularly worried, until it was finally realised that the painting had vanished: someone had stolen the Mona Lisa. Béroud, often confused with Jean Béraud (1849-1935) whose work I have featured here previously, was an odd painter. Born in Lyon, he had moved to Paris at the age of nine, and his growing artistic skills took him to train in the studio of Léon Bonnat (1833-1922), who taught Georges Braque, Raoul Dufy, Gustave Caillebotte, and others. He completed that training in 1873, and became an exhibitor at the Salon. 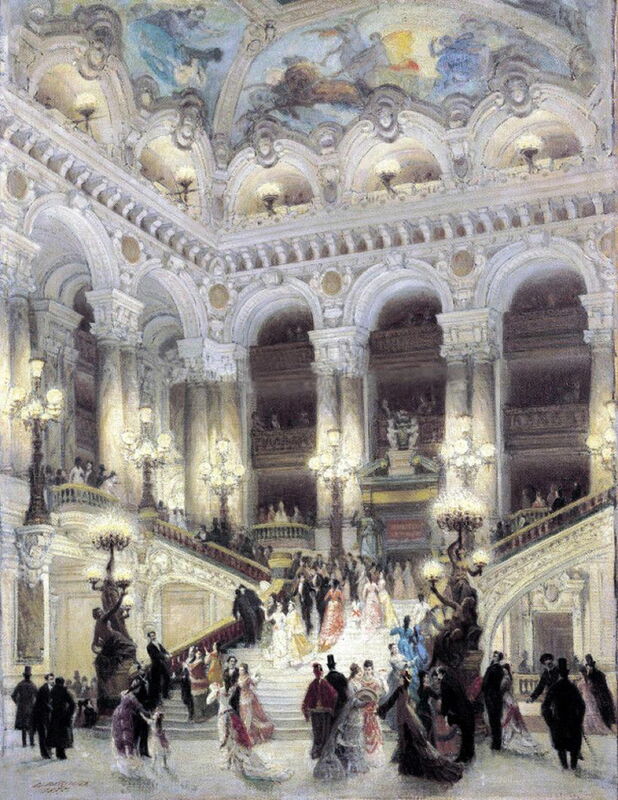 Louis Béroud (1852–1930), The Staircase of the Opéra Garnier (1877), media and dimensions not known, Musée Carnavalet, Paris. Wikimedia Commons. Those early works appear to have been quite impressive, like his The Staircase of the Opéra Garnier (1877). But he must have made little impact, perhaps a fairly comfortable living, if remaining eminently forgettable. Louis Béroud (1852–1930), Central Dome of the Gallery of Machines at the World Fair in Paris 1889 (1890), oil, 198 x 164.5 cm, Musée Carnavalet, Paris. Image by L’artauprésent, via Wikimedia Commons. 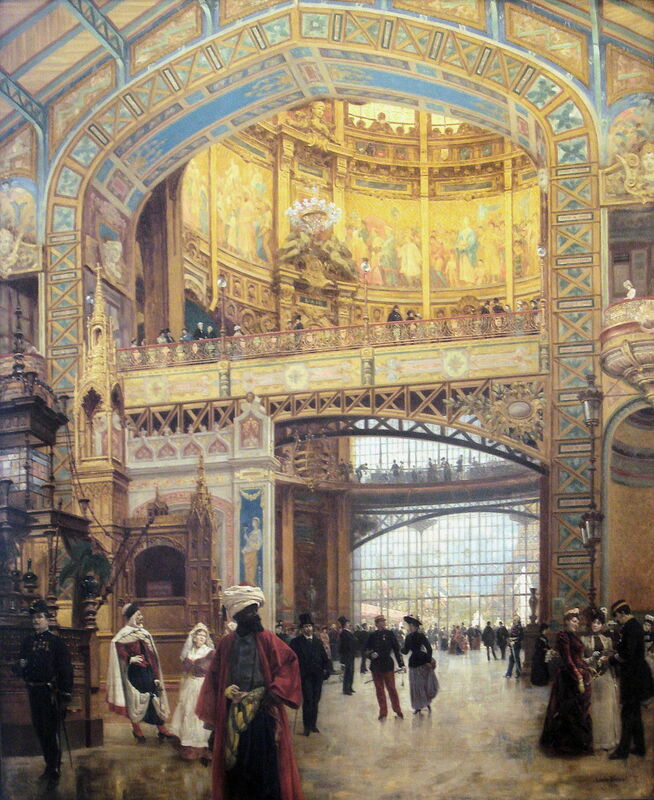 His painting of the Central Dome of the Gallery of Machines at the World Fair in Paris 1889 (1890) indicates a new direction, depicting people viewing exhibitions, and this may have taken him on to painting copyists in the Louvre. Louis Béroud (1852-1930), At the Louvre (1899), further details not known. Wikimedia Commons. 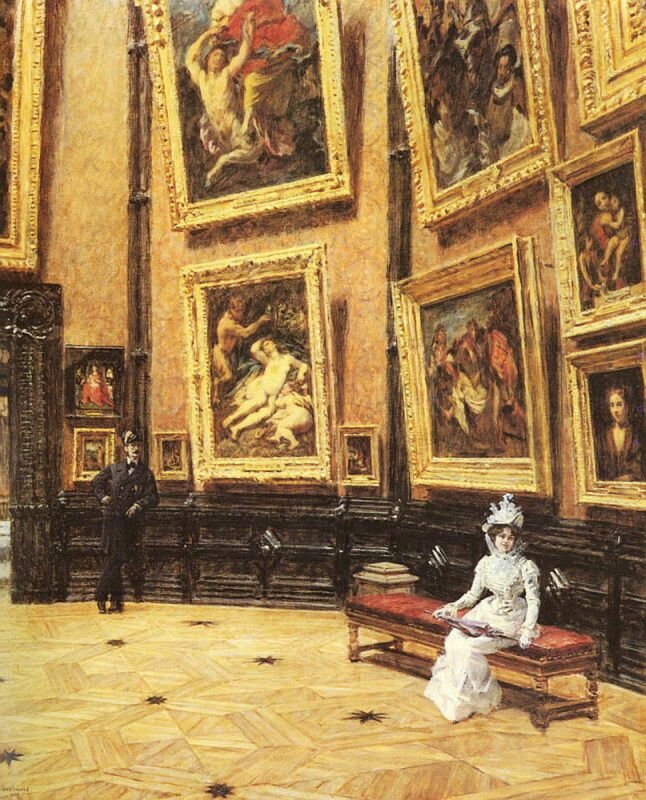 At the Louvre (1899) is the earliest work of his that I can find which shows the interior of the Louvre, although the pretty young lady posing beneath a painting of the deposition of Christ is merely sitting, holding her umbrella, and looking decorative. Nearer the nonchalant, even disinterested, guard is Correggio’s Venus and Cupid with a Satyr (also known as Jupiter and Antiope) from 1528, one of the gallery’s great treasures, and something of a favourite of Béroud. 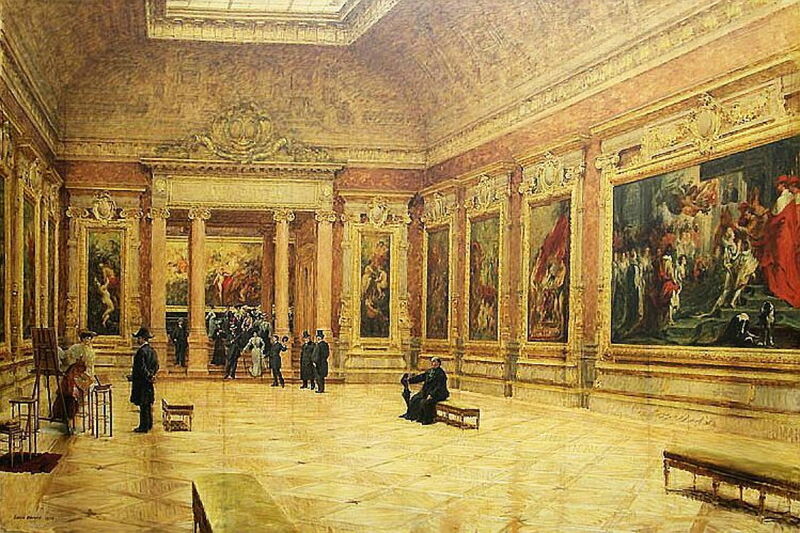 Louis Béroud (1852-1930), The Rubens Room in the Louvre (1904), media and dimensions not known, Musée du Louvre, Paris. Wikimedia Commons. 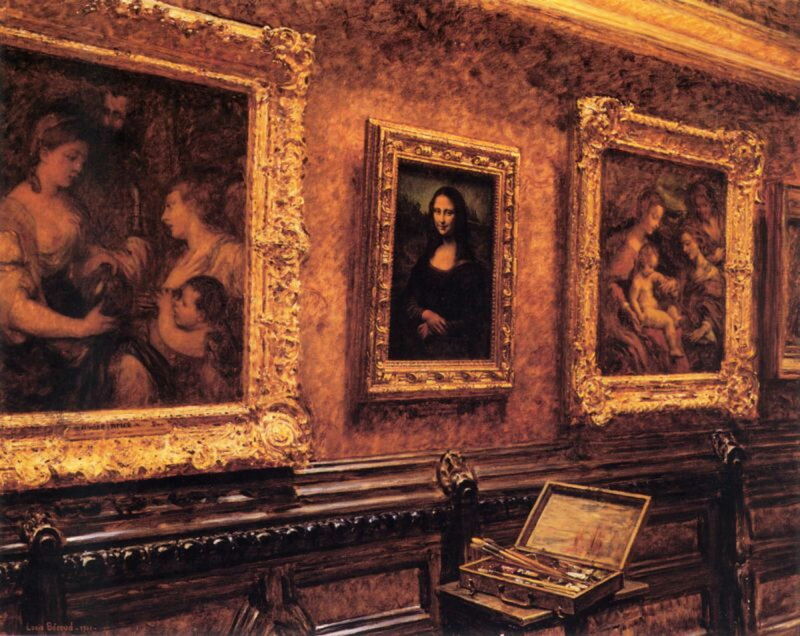 If you have visited the Louvre, you will be familiar with the many copyists who work there. Some are students who are improving their skills by copying the Masters, but many are painters who sell those copies on. 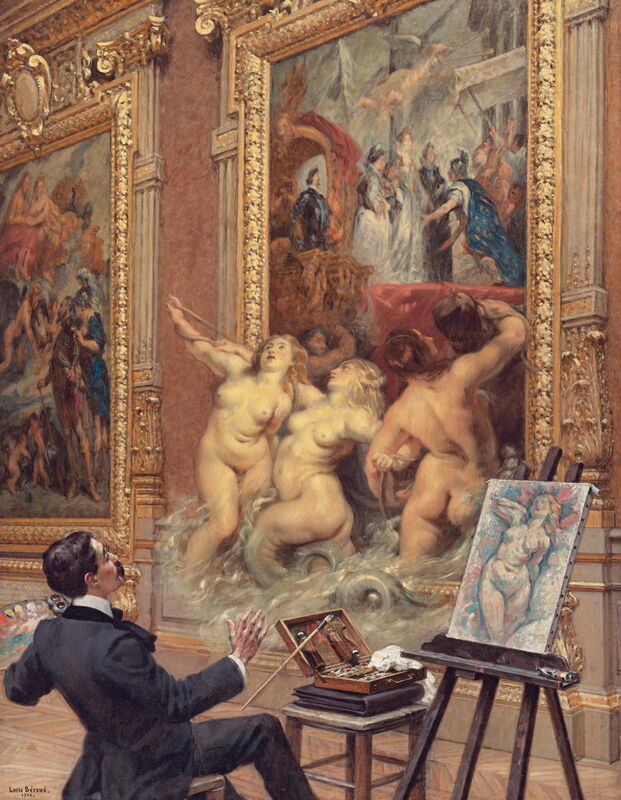 Béroud shows a copyist chatting to a man in The Rubens Room in the Louvre (1904). Louis Béroud (1852–1930), An Artist in the Louvre with Correggio’s Jupiter and Antiope (1908), oil on canvas, 91.4 x 73.0 cm, Private collection. The Atheneum. Béroud seems to have become obsessed with painting copyists, and in An Artist in the Louvre with Correggio’s Jupiter and Antiope (1908) returns to the Correggio. Note the use of a sheet of scrap paper under the copyist’s easel, to ensure that no drips of paint ended up on the floor. All but one of Béroud’s copyists seem to be women, although today you’re almost as likely to come across a man. I suspect that reflects the more limited opportunities for women to train as painters at that time. 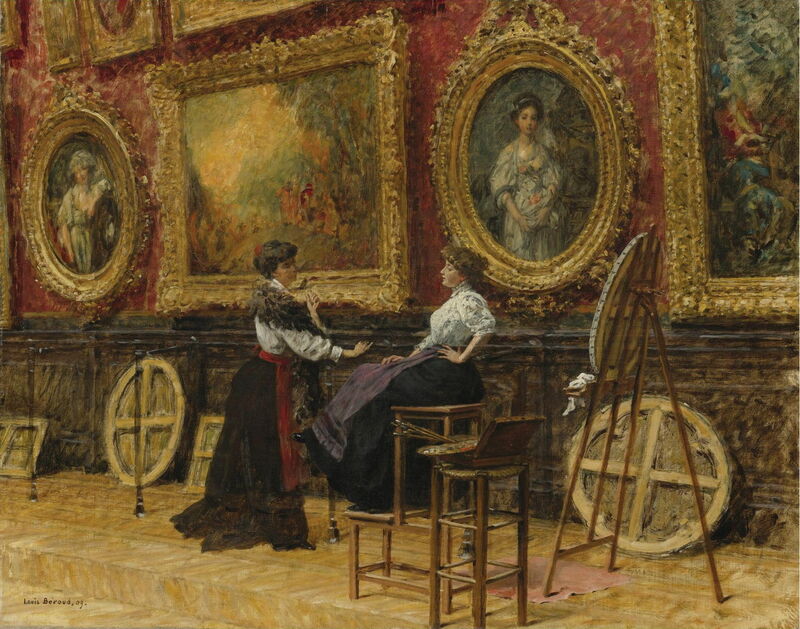 Louis Béroud (1852–1930), Copyists in the Louvre (1909), oil on canvas, 72.4 × 91.4 cm, location not known. Wikimedia Commons. He started to catch his models during their more social moments, as with the discussion taking place in his Copyists in the Louvre (1909). The large painting shown here is Watteau’s Embarkation for Cythera (1717); to the left is Greuze’s The Milkmaid (1780), and to the right his Broken Pitcher (1785). The Joys of the Flood (in the Medici Gallery) (1910) is probably the best of all Béroud’s paintings of painters painting paintings. This time the copyist is the artist himself, I believe, the only man to appear in that role in these works. Rubens’ huge The Disembarkation of Marie de’ Medici at Marseilles (1621-25) bursts into life, as its water starts to flood the Louvre and its three nudes step out onto the floor. 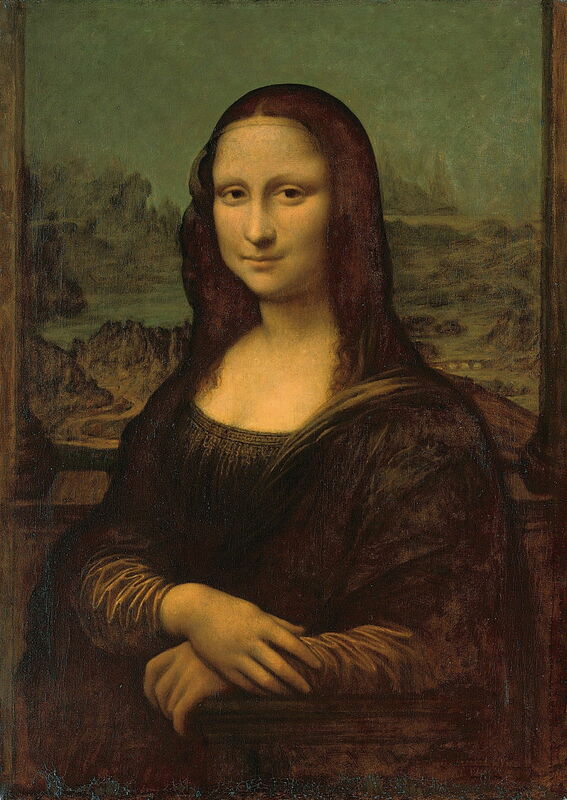 Then in 1911, Béroud turned his attention to Leonardo da Vinci’s masterpiece, in The Mona Lisa in the Louvre. The copyist is missing, though, as if to symbolise the disappearance of the painting, perhaps. It is most probable that this was the painting that Béroud was working on in the August of 1911, when the original disappeared. At the time, the police arrested first the poet Guillaume Apollinaire, then questioned Pablo Picasso. The painting appeared lost, until two years later, when Vincenzo Peruggia tried to sell it to the Uffizi Gallery in Florence, Italy. Being something of an Italian patriot, Peruggia had decided that it was time for the painting to return to its homeland, and had smuggled it out of the Louvre under his coat. He served six months in prison, and the painting headed back to Paris. 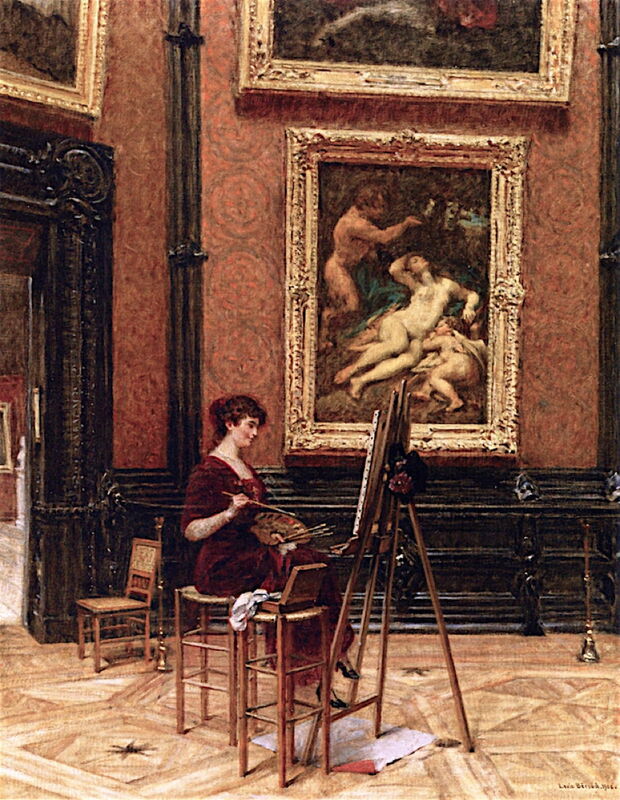 Louis Béroud (1852-1930), Painter Copying a Murillo in the Louvre (1913), further details not known. Wikimedia Commons. After his moment of fame, Béroud returned to painting his copyists. In his Painter Copying a Murillo in the Louvre from 1913, the only easel occupied is in front of Murillo’s The Young Beggar (c 1645). Coincidentally, this is Murillo’s four hundredth anniversary, which I have been celebrating here. Louis Béroud (1852–1930), The Toy Fairy (date not known), media and dimensions not known, mural in the Town Hall of the 10th arrondissement of Paris, Paris. Image by Coyau, via Wikimedia Commons. At some stage when he was working in Paris, Béroud left the galleries of the Louvre to paint this fascinating and fantastic mural of The Toy Fairy, on the wall of the Town Hall of the 10th arrondissement of Paris. It seems appropriate now, given that it’s Christmas. 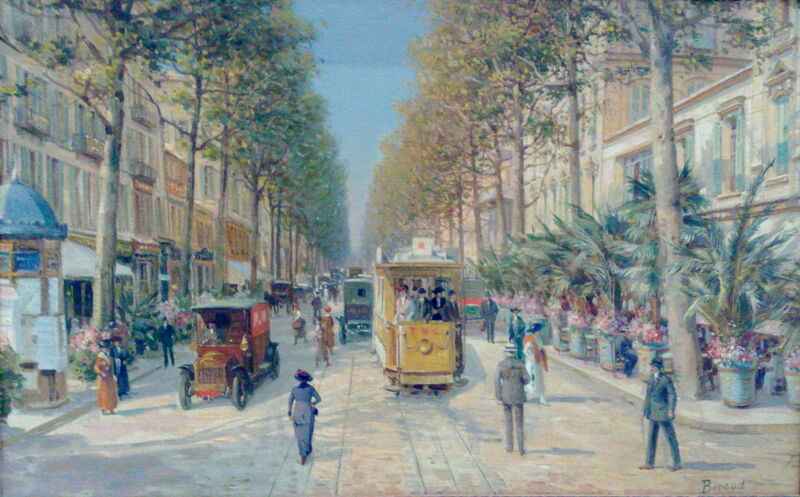 Louis Béroud (1852-1930), Avenue de la Gare, Nice (date not known), media and dimensions not known, Musée Massena, Nice, France. Wikimedia Commons. I like to think that Louis Béroud earned enough from his unusual paintings to be able to retire to the south of France, where at some time he painted Avenue de la Gare, Nice. But apart from the incident of the Mona Lisa, little else seems to have been recorded about him, and he died in Paris in 1930. Posted in General, Life, Painting and tagged Béroud, Corregio, da Vinci, Greuze, Mona Lisa, Murillo, painting, painting in a painting, Rubens, Watteau. Bookmark the permalink. “Louis Béroud (1852–1930) (attr), Copy of the Mona Lisa after Leonardo da Vinci (date not known), oil on canvas, 77 x 55 cm, location not known. Wikimedia Commons. I’m confused. Beroud or Beraud? Thank you for pointing out that I managed to fall into my own trap! Don’t feel bad…I have often been found falling on my own sword. No sure which hurts worse. At least these days we can always blame our little slips on autocorrect.